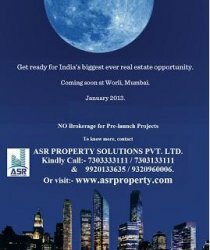 Lodha Group will be soon launching their most awaited ambitious project Lodha Blue Moon at WORLI in January 2013, one of the most awaited premium projects of the country and it will be currently known as Codename: Blue Moon. The project is already approved from 4 to 5 banks with IOD & CC being already obtained...!! Lodha Blue Moon is a Ultra Luxurious prelaunch Apartments by Lodha Group. Lodha Blue Moon has an unmatched amenities its offer 2/3/4 bhk elite apartments. This milestone assignment promises to redefine New Worli as transcending all potential; it offers you what most can only vision of: a impressive life. Life, as you live it in Lodha Blue Moon Worli, is a state of luxurious well-being, cocooned in beauty, comfort and privilege. You live in a residence that exudes world-class style and splendor, imposing amazing views of the Yeoor hills or the Ulhas river. This development is a rare confluence of the best that nature can provide. Be a part of the advantaged few to enjoy panoramic views of breaking dawns and receding sunsets from your sundecks. You enjoy the stylish metropolitan lifestyle of a exciting, cosmopolitan city. While you pleasure in the cloudy hills, forests, lakes and scenic rivers of a country retreat. Your every wish, every relieve, every desire, is predictable and provided for, right at your doorstep, from international schools to sports courts, world-class gyms to landscaped gardens. The developer has started a teaser campaign and will soon be collecting cheques from interested parties. The launch will be sometime in mid January 2013. These cheques will not be deposited till the project launch and clients will get rate advantage for early bookings... Developer shall keep on increasing the rates after achieving their strategic milestones. It is expected that the response will be humungous... Couple months back L&T at PAREL sold 400 units in just about 2 days... This location being far more premium, it’s expected to have faster bookings in huge nos. The developer is yet to come-out with total detailed information, which as soon as they finalise, they will communicate to us immediately. · The total Land parcel is of about 18 acres. · IOD & CC is already in place. · The Project is already approved from 4 to 5 Banks, developer will soon be sharing the APF nos. · Multiple towers (could be 3 to 5 buildings) – all high-rises approximately about 40 to 60 floors. · Configuration will be 2 BHK, 3 BHK & 4 BHK. · Developer has not yet confirmed the rates. ASR PROPERTY SOLUTIONS PVT. LTD. is perhaps one of the few real estate consultants in India that offer you advice and assistance for buying homes at NO BROKERAGE CHARGE. Kindly confirm Price and area on the phone. ASR Property Solutions Pvt. Ltd. aims to be one of the Best Real Estate Consultants in Mumbai.